The Otley Cycle Race is on 28 June. 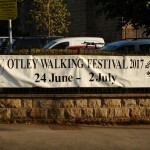 It’s one of my favourite Otley events and I’ve loved watching it as it has grown and grown. Particularly since the Tour de France came to Yorkshire, it has really taken off. If the weather’s good, loads of people come out and it’s a real community event. There are hog roasts (we’re open for sandwiches, cakes, hot snacks and coffee and drinks too). It’s great to see the TV stations with their cameras here. Everyone has a great time. It has been wonderful to see how Tom Pidcock, son of Gyles has grown up from competing in the junior races to competing in World and European under 18 competitions. Tom’s now 18 and I think he’s going to be the next big thing coming out of Otley. It just shows what community and encouragement (and great parenting) can do. So we hope that you can make it over to see this fantastic event and if you do, make sure you call in for a coffee and something delicious to eat!